These days, people are drinking their way to better health. A juice revolution is under way, and for Alexa Chandler ’16, it all started with a watermelon. An exercise science student, Chandler was interested in seeing if citrulline, an amino acid found in watermelon juice, could help relieve sore muscles. “So little research has been done, and people are always asking about preventing and reducing muscle soreness,” Chandler said. So she conducted original research with her professor to see if the amino acid could help with recovery. 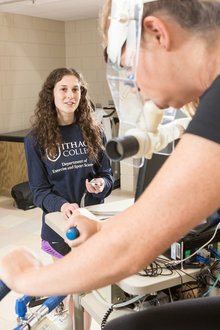 Chandler ran exercise tests, worked with human subjects, and learned how to use a variety of laboratory equipment with Thomas Swensen, professor and chair of IC’s Department of Exercise and Sport Sciences. “The first time I ran a bike test alone was exciting,” she said. “I didn’t think I could do it without a graduate student, but seeing how the participants trusted me motivated me to step outside my comfort zone.” While preparing to present her research at the Whalen Symposium, Chandler also learned how to use library databases and write annotated bibliographies, literature reviews, and abstracts. “These are all academic skills that helped me this past semester,” she said. Chandler is continuing to work on the project and collect new data.